AIKIDO is an effective, yet non-violent, traditional Japanese martial art. AIKIDO was developed by Morihei Ueshiba (1883-1969), a Japanese philosopher and master of kendo, spear-fighting, and jujitsu. O’Sensei (great teacher, as we refer to Ueshiba) was disillusioned with the endless cycle of violence and competition in the martial arts, so he designed AIKIDO as a discipline of personal refinement. Master Ueshiba taught the aikidoist to move with, rather than against, the attacker by drawing on our internal energy, or “ki”. Ones goal in AIKIDO is to redirect the opponents’ energy and neutralize an attack without harm. AIKIDO is non-competitive, taught in a cooperative manner, good exercise, and fun! AIKIDO is a Japanese martial art that was developed by its founder, Morihei Ueshiba, during the 20th century. This martial art is the synthesis of traditional Japanese ju-jutsu (pinning and throwing techniques), swordsmanship (ken-jutsu), staff techniques (jo-jutsu), and other internal martial arts traditions to form what is currently called AIKIDO. AIKIDO utilizes throws, pinning techniques, and evasions to defeat attackers. AIKIDO also includes classical sword and short staff techniques to help develop strength, coordination, and fundamental skills. AIKIDO is different from many other martial arts in its training and application. AIKIDO practice done correctly is strenuous but not violent, demanding but not rough. Class begins with warm-up exercises and stretches to relax and prepare the body for partner practice. Warm-ups generally end with ukemi (correct falling) including forward and backward rolls. Ukemi permits each student to practice AIKIDO with confidence and safety. The instructor then starts by demonstrating a technique to be applied against a certain attack. The class divides into pairs and each partner alternates being uke and nage (attacker and defender). Both partners depend on each other to safely and smoothly complete each technique. In this way confidence and fluid, continuous movement is developed. In accomplished AIKIDO practice there should be no struggling. Each partner becomes conscious of his/her own level of ability and that of his/her partners and should strive to improve that level with each class. Every class includes several different techniques to give the student an opportunity to look at the attack-defense experience differently. As students advance, the number of techniques, including practice with wooden sword and staff, and the level of difficulty is increased. The best way to find out what AIKIDO is about is to come try a class. You are under no obligation if you come and try or watch a class. Click here to schedule a trial lesson. AIKIDO is a modern Japanese Budo (martial art) that was developed by Morihei Ueshiba (1883-1969), a Japanese philosopher and master of kendo, spear-fighting, and ju-jitsu. O’Sensei (great teacher, as we refer to Ueshiba) was disillusioned with the endless cycle of violence and competition in the martial arts, so he designed AIKIDO as a discipline drawing on our internal energy, or “ki.” Master Ueshiba taught the aikidoist to move with, rather than against, the attacker. The defender thus redirects the opponent’s energy and neutralizes the attack without harming either the attacker or him/herself. AIKIDO differs from other martial arts in its training. Many other martial arts are practiced to gain fighting prowess. As O’Sensei’s experience grew, he realized that developing strength simply for fighting was futile. He developed AIKIDO as a means of individual growth and refinement. In AIKIDO training the student develops a strong body and a mind that is calm, free from contentious thoughts, and whose natural reaction in a confrontational environment is defense rather than offense, protection rather than counter-destruction. The ultimate goal in AIKIDO is for the individual to develop mental, physical, and spiritual integration. The practice of AIKIDO is characterized by a smooth extension of power, resulting in fluid, functional movements. 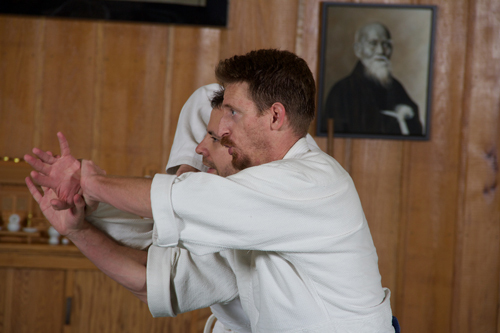 Many athletes find AIKIDO helpful in developing their coordination and reflexes. Anyone who studies AIKIDO can improve their abilities at skiing, tennis, and many other sports.